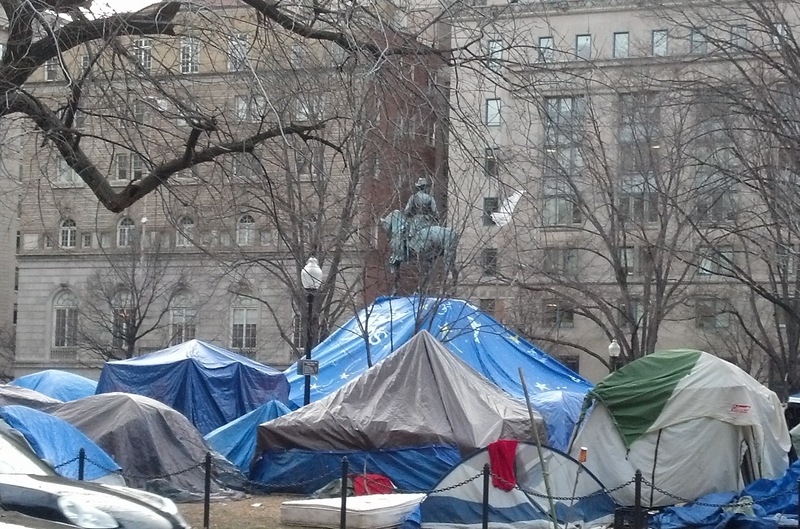 McPherson Square: Occupation or Hobo Camp? I work in Washington, DC, two block from McPherson Square. My commuter bus drops off and picks up right at the square, so twice a day, 3 days a week, I come face-to-face and nose-to-smell with Occupy DC. I watched them move in last fall, sometimes swallowing my anger, at times voicing it out loud as I witness the destruction of all that tender, brand new grass. The National Park Service spent $440,000 of stimulus funds renovating McPherson Square last summer. Nearly half that amount went into sod. Those of us who work near the square had just begun to enjoy taking our lunches to the square, which was also seeing visitation by a variety of upscale food trucks, when –oh joy–the Occupy movement came to town. The occupants of McPherson Square have no designated leader. There is no coherent message. They have published no demands to be met in order for their “occupation to end. Day after day, I see a collection of unwashed, unkempt, disrespectful hippies loitering around the square or nearby cafes (who, for the most part, have removed their outdoor furnishings to discourage loitering) who do nothing more constructive than paint nonsense on signs. Not me. Not the other 2-3 dozen people standing the line for the bus with me every day. I asked. Not the people with whom I work, either (I asked). We are the “99%”, too. We didn’t ask a bunch of hobo hippies to come destroy our newly-restored park and run all of our cafes and eateries out of business. We didn’t ask you to run up a $2 million tab for police protection and other city services. We pay taxes and we’re pretty fed up about it. Oh, and one other thing. We want you to take that FUGLY tarp off General McPherson’s statue, too. This isn’t Hogwarts, and you aren’t Harry Potter. Slyther back into your dens with the rats you are hosting. The evictions have begun. I witnessed NPS employees picking up and tossing into a trash truck the garbage (plastic, tarps, milk crates and other junk) left behind by occupiers who had, presumably, voluntarily left the square. I also saw at least one occupier strike his tent. It was a small, but important step. The federal government’s fiscal year ends in five business days, on September 30, 2011. Unless Congress acts to provide emergency funding (a Continuing Resolution), most government agencies will not have authorized funds to operate. Much of the federal government will shut down. When Congress fails to do their job, we all pay, and not just inside the I-495 Capital Beltway. We’ve learned, however, that social security checks still go out, federal taxes get collected, and TSA airport screeners till show up for work. There are, in fact, a few appropriations bills that have passed, and a few government agencies whose funds come, not from appropriations, but from income collected in fees and taxes. Many Americans think that the shenanigans on Capital Hill don’t directly affect them. After all, they don’t work for the government, right? Why should they care? Congress has a few exclusive powers under the US Constitution. Among those very few exclusive powers is the authority to raise taxes and distribute revenue to the executive branch. Revenue bills must originate in the House. All the other blather, goings on and dealmaking in the House and the Senate are secondary to their main job of raising and distributing the ebb and flow of money into and out of the US Treasury. This is their job. When Congress fails to do their job, under law the Executive Branch (and this includes the military) cannot spend money. This falls under the Antideficiency Act, which makes illegal spending money before it is appropriated. A government employee can go to jail for this. Now to why you care…. Imagine for a moment you are a company that has bid a contract to do work for the government. By the way, it costs a lot of money and takes a lot of time to put in a bid for the federal government. It also takes a lot of time for the feds to get around to selecting the contractor and awarding the contract. You don’t get paid for any of this; it’s a gamble you take and a cost of doing business. Congratulations! You are the winning bidder and will be awarded the contract…as soon as the budget is approved. The project will start on the first day of the next fiscal year (if the budget calendar goes the way it is supposed to go). It doesn’t go that way, does it? Republicans “stand on their principles” and Democrats want to “tax the millionaires”, and now we have no budget, and we have a continuing resolution. Under the rules of a CR, no new projects can start. We NEVER had a budget in 2011. The government operated on CR for the ENTIRE FISCAL YEAR. Meanwhile, our poor contractor has hired workers, built an assembly line and stocked parts in anticipation of an October 1 startup. He had to, because he was expected to be ready to produce if he wanted to keep in good graces with his government customer. Now he either has to keep all those people on the payroll or lay them off. He either has to send back the parts or keep them. He has no income to offset those costs. For every month Congress bickers and delays a full spending bill, he loses thousands or millions of dollars, depending on the size of the business or investment. This loss trickles cascades avalanches down through the supply chain and through subcontractors to affect businesses and paychecks all across America. Raise your hand if you know someone who earns at least part of their living making or selling something for or to the federal government either directly or indirectly. I bet their rainy day fund is pretty dry about now.